In our culture of sitting at computers and texting on our phones, our necks pay a price. The cervical spine bears the weight of our head and all the stresses and strains of life. This can lead to pain, stiffness, tension and decreased range of motion. Over time, with all this rounding, the head becomes held forward of the body. The neck has to find a way to support this weight, with your back and shoulders, which can even affect your jaw, arms and wrists. 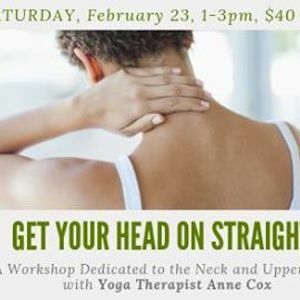 In this 2 hour workshop, learn how to use self massage to release the muscles and fascia of the neck and upper back and to open up the front of the body. Breath and meditation techniques will also be introduced as a ways to allow the “weight of the world” to fall off your shoulders and to encourage an open heart. With these areas more relaxed, you will learn ways to strengthen all the supporting muscles. These areas now learning to function effectively, the head can find its way back to being supported over the centre of the spine and body, how it was meant to be. Now that the head is held with strength and not tension, start saying goodbye to all those pains in the neck, back, jaw, headaches, and even wrist issues that can occur. 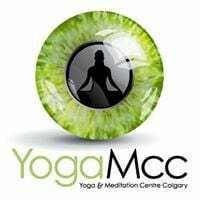 Anne Cox E-RYT 500 started practicing yoga more than 20 years ago due to chronic headaches. She found out she has degenerative discs in her neck due to accidents she had in her youth. Her headaches were due to tension held in the upper back and neck that were both physical and emotional. She teaches from her own experience of helping her neck, back and body come back to health while managing the stresses that added to her dis-ease. Summer Spirit and Soul Fair.